It’s early Saturday morning and I’m on a mission to get several of the crafty projects I finished recently, posted. I don’t know why downloading and cropping the photos has seemed like a monumental task the past week, then again everything seemed a little more difficult this week. This first card I like to call ‘Ode to Inky Button’. I worked a class that the fabulous Angela taught last week on two of my favorite things, Bellas and Copics. She was kind enough to stamp a couple of images of girls I don’t have so I could play with them at home. 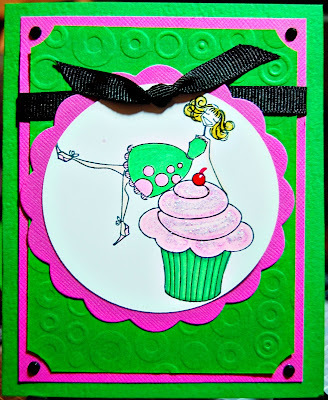 I set out to make an Angela-esque card with Cupcakeabella. While mine is not nearly as cute as hers, I think I worked in most of the Inky Button trademarks. Let’s see…Bella? Check!, Ticket edges? Check! Bling? Check! Copic layering? Check! Embossing Folder? Check! Black Ribbon? Check although for true IB style it should be wider. Glassy Accents? Check! This second card has quickly become one of my all time favorites. I designed it for the January Frenzy at the store, but of course forgot to post it here…or did I post, hmm I guess I should have checked before I started this post. C’est la vie. Other: QK Thank You Goosebumpz, Tim Holtz ruler — I love, love, love this ruler… so I went to find a picture of this ruler in case you wanted to run out and get one and you needed a picture and found something even better…because I know how much we all love Tim, how about a demo from Tim himself. 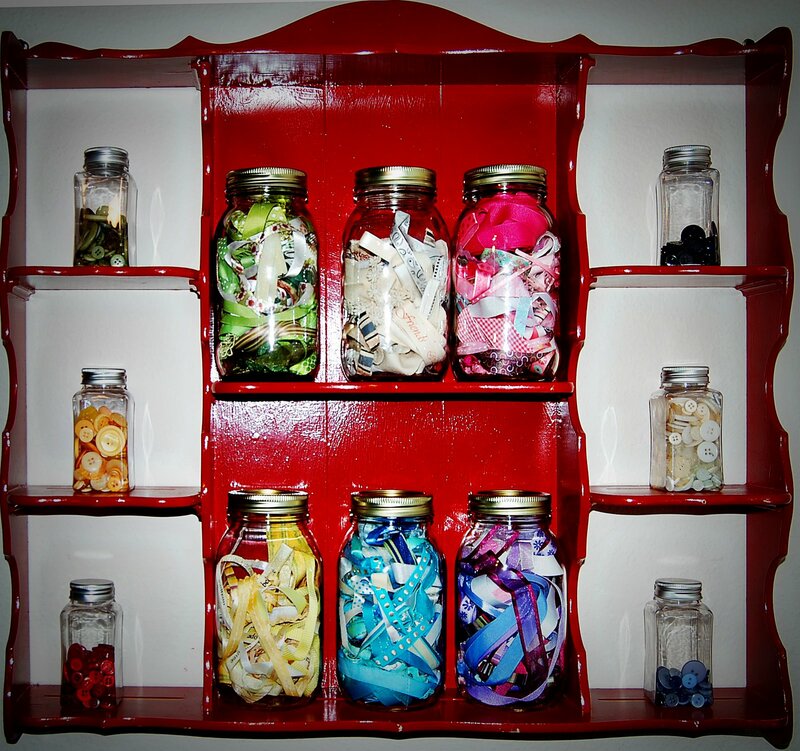 Jars full of ribbon and pretty vintage shelf to put them on. I found this cute shelf at Patina(sadly no web presence to link you too) and thought it would be the perfect reward for cleaning out the scraproom and surviving the past couple of busy work weeks. The shiny red paint makes me smile each time I look at it. 4. I’ll remember that the garbage collector and/or UPS truck is NOT stealing our stuff. 5. I will not roll my toys behind the couch. 6. I must shake the snow and rain out of my fur BEFORE entering the house. 7. I will stop trying to find the few remaining pieces of clean carpet in the house when I am about to throw up. 8. 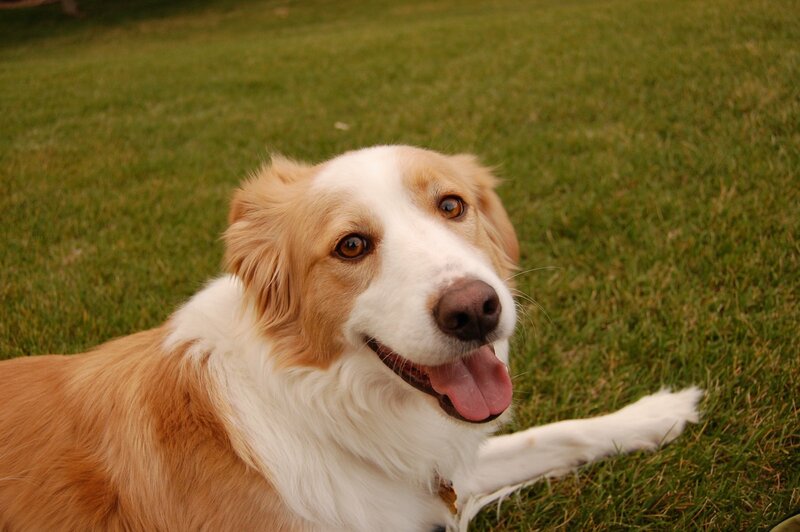 I will not eat any more socks and then redeposit them in the backyard after processing. 9. I will not wake Mommy up by sticking my cold, wet nose up her bottom end. 10. I will not chew crayons or pens, especially not the red ones, or my people will think I am hemorrhaging. 11. When in the car, I will not insist on having the window rolled down when it’s raining outside. 12. We do not have a doorbell. I will not bark each time I hear one on TV. 13. I will not eat my Mom’s underwear. 14. The sofa is not a face towel. Neither is Mom’s lap. 15. I will not put my paws on the counter or steal any more Christmas roasts. When the world changes, the rules change. If you insist on playing today’s games by yesterday’s rules, you’re stuck. Today is the big day…I’ve packed all the crap and hope it moves on to deserving homes. The trick will be not taking home as much from the other sellers as I brought. If you’re a papercrafter in the Denver area, trust me you don’t want to miss this sale. I had a sneak peek last night and there are some super bargains! 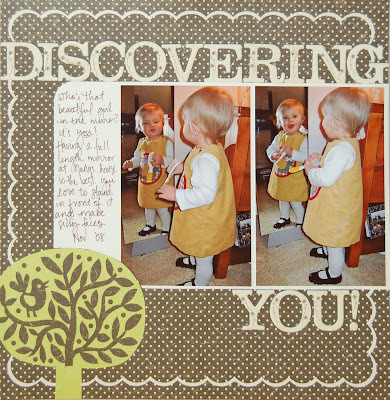 2.00 stampin up stamp sets—can’t beat it. Stop by the store and get ready to shop. It’s time to face the music, my scraproom and Houston’s had both reached a point a few weeks ago where neither one of us could really scrap in the area. So we made a plan to help each other plow through the excess. I’ve long been a proponent of the the Love and Logic model in working with kids, in training we say it works on kids, dogs, dolphins even husbands, but could it work on friends with out of control scraprooms? and it worked. Both rooms are on their way back to being the clean, organized and inspiring space we want them to be. I’m thankful for such a good friend. I’m thankful for a organized space that allowed me to make a this layout in under 45 minutes. I streamed the key part of the inauguration and was moved to tears, as I watched it again at home this evening I teared up again. I believe in this man. I believe in a better future for the children in my family and those I’ve served for so long. successful, and get the things I want. But then the two of you came into my world with all your curiosity and mischief and those smiles that never fail to fill my heart and light up my day. And suddenly, all my big plans for myself didn’t seem so important anymore. I soon found that the greatest joy in my life was the joy I saw in yours. And I realized that my own life wouldn’t count for much unless I was able to ensure that you had every opportunity for happiness and fulfillment in yours. In the end, girls, that’s why I ran for President: because of what I want for you and for every child in this nation. I want all our children to go to schools worthy of their potential—schools that challenge them, inspire them, and instill in them a sense of wonder about the world around them. I want them to have the chance to go to college—even if their parents aren’t rich. And I want them to get good jobs: jobs that pay well and give them benefits like health care, jobs that let them spend time with their own kids and retire with dignity. country—but when we do, I want to make sure that it is only for a very good reason, that we try our best to settle our differences with others peacefully, and that we do everything possible to keep our servicemen and women safe. And I want every child to understand that the blessings these brave Americans fight for are not free—that with the great privilege of being a citizen of this nation comes great responsibility. unfinished work of perfecting our union falls to each of us. It’s a charge we pass on to our children, coming closer with each new generation to what we know America should be. I hope both of you will take up that work, righting the wrongs that you see and working to give others the chances you’ve had. Not just because you have an obligation to give something back to this country that has given our family so much—although you do have that obligation. But because you have an obligation to yourself. Because it is only when you hitch your wagon to something larger than yourself that you will realize your true potential. These are the things I want for you—to grow up in a world with no limits on your dreams and no achievements beyond your reach, and to grow into compassionate, committed women who will help build that world. And I want every child to have the same chances to learn and dream and grow and thrive that you girls have. That’s why I’ve taken our family on this great adventure. patience, poise, grace, and humor as we prepare to start our new life together in the White House.